Going on a safari tour was on my bucket list. I mean, I couldn’t come to Africa and not see an elephant or a giraffe in the wild right? Since I am traveling solo and there’s so much to see and do in East Africa I thought it could be fun to try the group tour thing. While I was in The Gambia, I spent numbers of hours researching on the different companies, the different routes, the different activities offered. I knew I wanted an adventurous kind of trip where we would camp, see all kinds of animals, experience the culture and that would suit my budget. So I finally booked a 16 days trip (20% off because of low season! Bonus!) with the company Intrepid and opted for the Kenya-Uganda-Rwanda route. My next blog entries will be about the three visited country on my trip, but for now, here are my pros and cons of my first group tour. -No planning to do. Everything is perfectly organized, from the route to the activities to the meals. It’s considerably less time consuming (and stressful) than traveling solo so more time to relax and enjoy the holidays! -I did 2 weeks of camping (for me that is a big plus!). Intrepid provides the tents and mats so you only have to bring your sleeping bag. I must say that sleeping beside elephants and hippos is a pretty unique experience! Although you don’t feel like going peeing in the middle of the night! -Comfy ride. 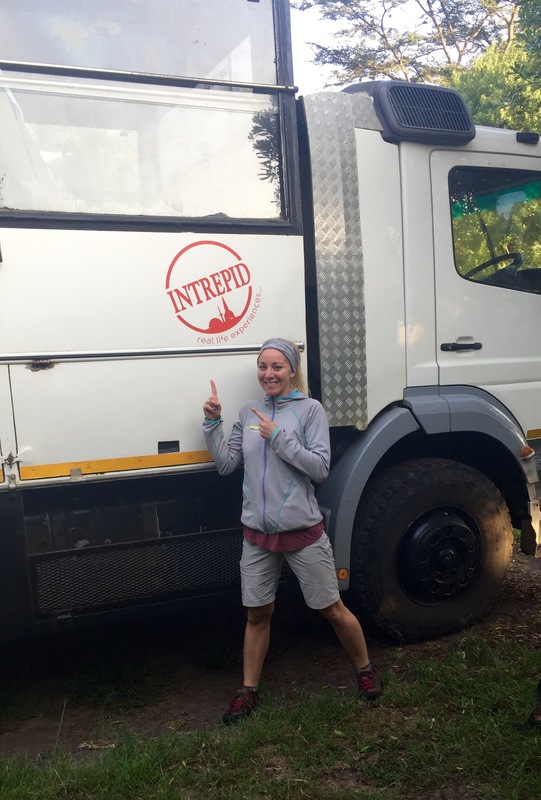 I got to travel in a comfortable truck (no chicken or goat running around like the public transport in Senegal! ), and because we were only 13, we even had our own double seat! No one had to fight for a window seat during game drives! -Having a local guide 24/7. Forget the Lonely Planet, we had our own live encyclopedia to teach us about the country and the culture, tell us stories and answer any of our questions! -A lot of time on the road! We did a few (too many!) 8+ hours driving days. I should have known that covering three countries in two weeks would mean a lot of bussing… At least the scenery was pretty impressive!! And thank god for podcasts and my entertaining fellow travelers! -You don’t get to interact as much with the locals. Since you’re traveling with a group and stay in the touristic areas, you don’t have many opportunities to meet locals. Especially after living 3 months on the west coast and traveling by myself for a few weeks, I was kinda enjoying hanging out with Africans all the time! -You eat whatever’s on the daily menu. Don’t get me wrong, our tour chef was great but I didn’t get to taste the local flavor as much as I wanted to! Yes for cheap street food!! -It’s more expensive than traveling solo, but you get to do and see more in less time. So at the end of the day, you get your bang for your buck! -And finally, as much as I’m a social person, I also like my ‘me time’. When you are traveling with a group it is often difficult to spend time by yourself. My solution: Everyday when we were arriving at our destination, I was putting on my running shoes and see ya later alligators! For me it was the best way of exploring a new place but also of escaping the group for a little while. This trip did fulfill (almost) all of my expectations. Each country was unique in all its aspects (sceneries, wildlife, culture, language, people)! Two weeks was also a good length for a group tour (for me) but it is also VERY short to make it worth the visit of three countries. I did enjoy every minute of my trip but feel like these countries have so much more to offer. It’s like eating just the ‘M&M’ in the trail mix. Yes, they are most people’s favorites, but almonds, peanuts, cashews, raisins are also really good to eat and part of the mix!! C’est vraiment inspirant de lire tes escapades et de te suivre! Chapeau Juliane!